FOXBOROUGH, Mass. 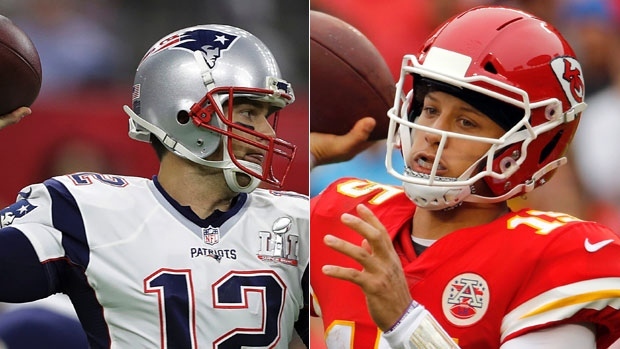 — Patrick Mahomes was barely 5 years old when Tom Brady completed his first NFL pass in 2000. "That's the future of the league, so it's always great to see young players come in and learn from the guys in the past," the 41-year-old Brady said Friday. "Just like I did when I was young. I had a lot of guys that I looked up to, got to play against Brett Favre and some other really great players." "My coach in college was Kliff Kingsbury, and he actually was a backup for Brady at one point," he said. "And so he showed me things that he liked with Tom and his pocket movements and stuff he did within the pocket that I've tried to put in my game a little bit. "He's someone that's had a ton of success in this league and is someone that you do take stuff from." "I think quarterbacks always pay attention to other quarterbacks," Brady said. "You're just watching the way they're moving the ball. There's a lot of different ways to lead your team and move the ball down the field and score points. "So if you can learn things from other players you're always trying to and if your offence is hot, you're scoring a lot of points, I think everyone is trying to learn from what they're doing. They're just executing really well and I think that's what we need to take from them." Brady understands that his defence clearly has more reason to take greater interest in Mahomes than he does. "I look at it as a team that's 5-0," he said. "They're very talented and they've been playing very well all season and that's how I see it." He added: "This one's going to go down to the wire. They're good in all three phases, they score a lot of points, they rush it well, they've got a lot of skill players, they've got a lot of playmakers on defence. So we're going to be tested in all areas." Brady is hitting 69 per cent of his passes with 12 touchdowns and an uncharacteristic six interceptions — the last two off the hands of his receivers — for a 96.1 rating. He said he reached out to Drew Brees after the New Orleans quarterback overtook Peyton Manning on the all-time passing yardage list. Brady, who goes for his record 200th regular-season win Sunday night, and Brees are both chasing league passing records. Asked if he and Brees are competitive over the numbers, he said, "Not really . mildly competitive guys. "We played against each other in college. We beat him — my senior year (Brady at Michigan, Brees at Purdue), which was good. He's had a great career. I think so highly of him and everything he's accomplished. He's a great player, a great leader, played on two different teams, been so productive," he said. "It's great when you see that happen. It's a very competitive league, and to be around competing is really a privilege to still be able to do it. I feel that way myself. I'm sure he does, too."